"Olga, Masha and Irina, with Natasha close behind, have fled the pages of Chekov, waited awhile in Beckett, and finally found a home in Deborah Zoe Laufer's wonderfully funny "The Three Sisters of Weehawken"
"A killer script steeped in theater history. And its 90-minute runtime is hard to beat, too. 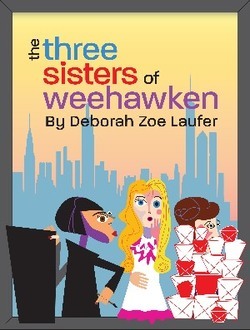 Yes, The Three Sisters of Weehawken is an absolute must-see." ​​ "Laufer's play is sharp, funny and, in its overriding theme, heartbreaking. That message? Don't squander your days. Remember to live." ​​​Olga, Masha and Irina have dreamt of returning to their childhood home of Manhattan all their lives. There It lies, gleaming, a mere ferry ride away from their provincial home in Weehawken, New Jersey. Though their sister-in-law, Natasha, tries to help them realize their dream with offers of work, tickets, maps, guidebooks, even anti-depressants, old patterns are hard to break. And that fifteen-minute ferry ride may as well be a mission to Mars. As they remain, decade after decade stretching into old age, the walls of their world move in tighter and tighter, until it becomes nearly impossible to move at all. Borrowing as much from Becket as Checkov, The Three Sisters of Weehawken, wonders at the forces that keep us from following our dreams, and begs the question -- how little can one live, and still have lived “a life”? OLGA: The oldest Prozorov sister. The hard working spinster. She’s 29 at the top of the play. MASHA: The middle sister. 22 at the top of the play. Grrr. IRINA: The youngest sister. 21 at the top of the play. Naïve and hopeful. Loves to dance. NATASHA: Their sister-in-law. 18 at the top of the play. Somehow desperate for their love and approval. ​"As playwright and director, she takes the women and the audience on a darkly funny, finally sobering and poignant journey from 1958 to 2016." "Laufer's play is sharp, funny and, in its overriding theme, heartbreaking. That message? Don't squander your days waiting. Remember to live." "Theatre Lab is one of the best things to ever happen to the Palm Beach County theater scene, and The Three Sisters of Weehawken is its first full production. It will be very hard to top. Presented in an intimate space, the play is unassuming but assertive, with powerful performances, a thoughtful set, and a killer script steeped in theater history. And its 90-minute runtime is hard to beat, too. Yes, The Three Sisters of Weehawken is an absolute must-see." "Olga, Masha and Irina, with Natasha close behind, have fled the pages of Chekov, waited awhile in Beckett, and finally found a home in Deborah Zoe Laufer's wonderfully funny "The Three Sisters of Weehawken,"
"The Three Sisters of Weehawken" is a ninety minute one act filled with gags both broad and subtle but it has a line of poignancy running throughout handled beautifully by all four actors."